I do love the look of these and they are super easy to apply. They come with 16 Nail Polish Strips, A Cuticle Stick & a Mini File/Buffer as well as instructions on how to use them. I'm not one to just apply one nail design or colour to all nails I do enjoy mixing it up a little and I love the look of this pattern Mixed with Essie's Butler Please. Butler Please is apart of Essie's Winter 2012 Collection (I purchased mine off Ebay) & it is fast becoming one of my favourite blue nail polishes. 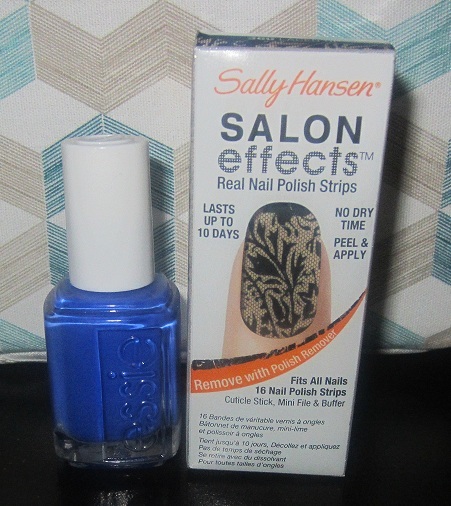 It is very similar to Sally Hansen's Pacific Blue though it is slightly darker. I've seen a few review on this polish saying it is a very difficult formula to work with but I found no problems with it. I used 2 coats of Butler Please & 1 coat of Seche Vite Top Coat and this is what I came up with. Let me know what you think. Have you tried any of the Nail Polish Strips let me know. I really like the look of these nail strips. Were they difficult to apply? they are so easy to apply (well I think so) .. I havn't used any other brands to compare but what I like about these are the fact that when you get to the end of your nail the excess nail strip literally pulls/melts off. Before I purchased them I actually watched a youtube video on how its done haha but it pretty much shows u what to do & now I am obsessed with these. That nail combo is beautiful!! That's a really nice shade of blue! And the salon effects look heaps cool.